Witnessing the turnover event are (from left) Sta. Clara Asst. Vice President for Administration Reynalyn Claudilla, Insular Life Financial Advisor Suzzette D. Carmen, and Sta. Clara Sr. Vice President for Operations Ulysses Bautista. Sta. Clara International Corp. Crane Operator Henry Monsanto receives a check from Sta. Clara President Nicandro Linao representing his retirement benefits after 18.5 years of service. 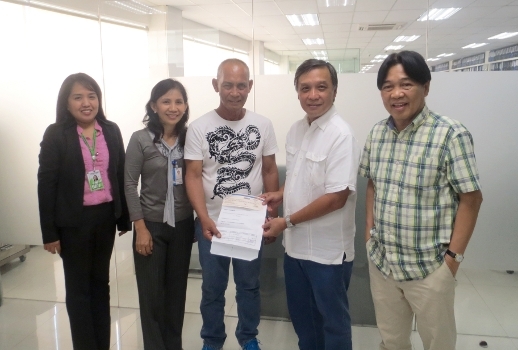 He is the first retiree-beneficiary of the Group Comprehensive Plan (CGP) that Insular Life has been providing for Sta. Clara since 2013. The CGP provides for a Group Term insurance coverage and allows for a side fund build-up. It is a complete employee benefit that gives insurance coverage and provides BIR-qualified retirement fund management. Sta. Clara International Corp. is one of the leading Engineering and Main Contracting Groups operating in the Philippines & in the Middle East, in the Power, Infrastructure and Civil Engineering sectors. For inquiries on how you can provide your employees with the best benefits, call Insular Life’s Group Marketing Division at 878-1818 loc. 5501 to 5505.